Efforts are underway to disrupt and paralyze the economy of Iran,Pakistan and China. Under the prevailing situation all the regional countries should unite and establish a trade free zone otherwise all will have to face difficult situations in future. Things were going smoothly until decided to mess it all up on the behest of his Israeli American son in law and his close friends in neighboring countries. When the US and Iran's conflict is getting serious and the US is threatening the countries who will side with Iran , it is such a wise move to side with Iran. We must interfere in every country's dispute if their dispute is with a super power. Soon we will see a real humongous change as was promised by PTI. Iran is a neighboring Muslim country. It is definitely in our interest to increase bilateral trade and cooperation in all possible fields. And Pakistan should devise its own foreign policy without being intimidated by the USA. Very encouraging meeting between estranged brother nations. Much to be done on the ground though. Gas line and electrical connections would be a good start. Good relations with neighbours sharing geographical boundaries are essential for own security. However Pakistan and Iran share history, religion and much more. 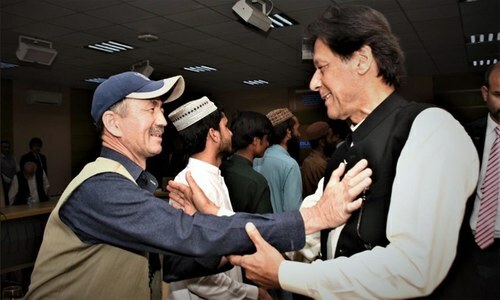 Iran, after Imran Khan stepped in as the most popular leader of Pakistanis, hoisted Pakistan flags in its cities at the occasion of independence day of Pakistan which shows warmth in between the both. I am proud of you, Naya Pakistan!! This may anger Saudis Aribia,? Pakistan's instance should be diplomatically balanced keeping in view of fued between Iran and Saudi Arabia.Qatari boycott by gulf states also be considered before making any comments.In entire middle East,there is polarisation. Coming out of economic mess should be priority. 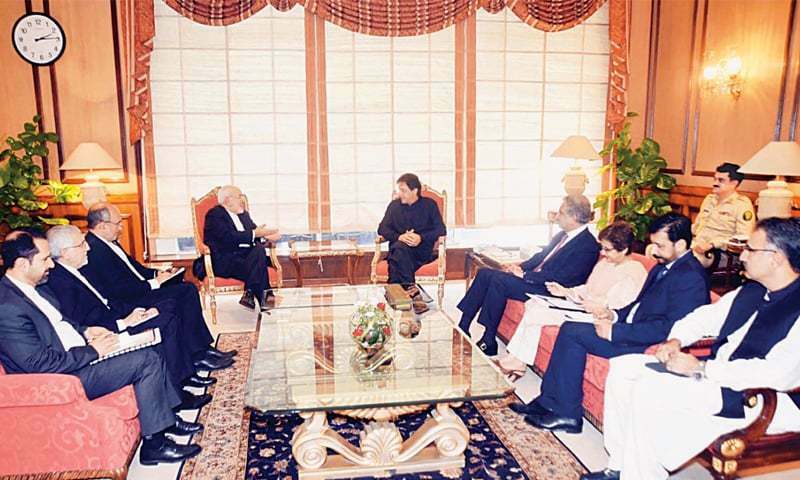 Pakistan-Iran relations have taken a turn for the better opening the door for closer cooperation in all fields especially in the economic, trade, energy and connectivity sectors. Relations in the culture and education fields should also be promoted as it can increase people to people contacts. 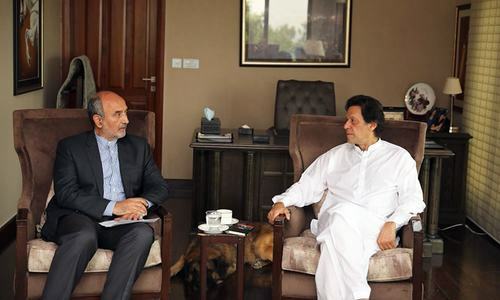 The new government's desire to further strengthen ties with Iran and similar willingness shown by Tehran is a positive development that can lead to further deepening of political relations between the two neighbors. 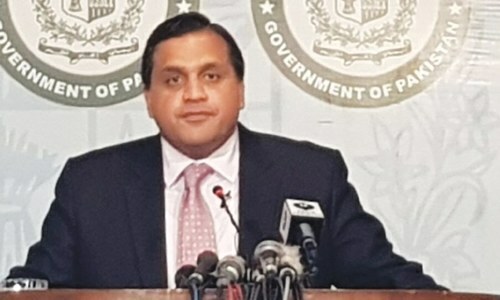 Pakistan ought to have a balanced Foreign Policy and leave enough flexibility during the said policy, what do expect from an implanted foreign service officers, they sit at the Foreign Missions Office's and collect big salaries plus the TA and DA allowances plus numerous holidays,, PM Khan should take a stick to the foreign office as well. Wrong timing Imran, wrong timing!! With Pompeo coming in few days, this statement will cause problem for us. 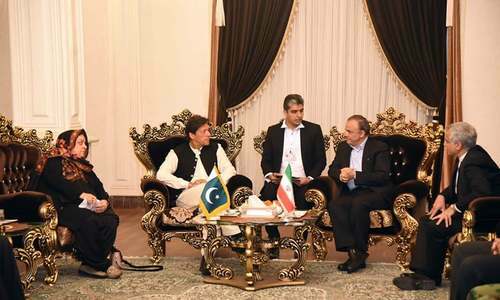 Good initiative, our relationship with our neighbours will strengthen under PM Imran Khan's leadership, particularly with Iran. It is a two way process based on mutual respect and interests for the sake of peace in the region. I think this is a principled stand. Pakistan should not jeopardize its relations with it neighbouring countries because of another country which does not share anything with it, borders culture etc. Pakistan can be the bridge between Iran and India and Iran and Saudi Arabia. Regional relationships if nurtured properly can also resolve the Afghanistan problem. Peace in the region can lead to disarmament and bellicosity between states and promote a new era of regional stability and prosperity of its people. Pakistan first. The world salutes Pakistan for standing by the side of Iran against the action of a powerful outlaw.The RCD between Pakistan,Iran and Turkey calls for revival. US cannot play with Imran! Imran needs protection, a lot of governments will come after him including US. US has a habit of terminating people that dont play along. Now it is time to make link between Chabahar and Gwadar for the betterment of the neighbouring countries Pakistan, Afghanistan, China Iran and central Asian Republics. India backtracked to buy oil from Iran on US pressure. This is exactly what Pakistan must do. Iran was the first country to accept Pakistan as an independent state. It also provided free fuel to Pakistan in 1965 war against India and it has continued to assist Pakistan despite its own issues with US i.e. constructed it's part of 700 million dollar gas pipeline, which Nawaz sharif wasted under Saudi influence and US pressure. Iran continued to provide electricity at cheaper than our own wapda to many areas in Balochistan and given countless full fee scholarships to our people. So there is a lot that Iran has done for us, which we need to show our gratitude for. @Ahmed Kamal This is so Nawaz sharif logic. Foreign policies are not designed based on such things. If it may "anger" them, then so be it. We have to work on whatever is best in our interest. @Sarfarz What has Saudi Arabia done for Pakistan? Not a good idea to anger Saudi Arabia. Our relationships cannot be just based on pleasing or displeasing someone. So, this is a good decision, expand our circle of friends and alliances that are in our interest. Other will respect it too. Iran is more worse than US... Pak should never back these culprits at any time and any level. US role is like a wolf and and Iran is like a wolf in a sheep's clothing... They both are our enemies. To those worried about Saudi Arabia's reaction, let me remind them that Saudi's population is only 33 million people. Pakistan, with 220 million people, is 7 times larger, and has supplied Saudi Arabia with the manpower to build that country over the last 40+ years. Pakistan has the potential to be a giant of the Muslim world, and cannot and should not make its foreign policy decisions based on what pleases or displeases the Saudis. All surface displays of closeness and friendship. Any single issue of disagreement and the goodwill evaporates. Must not fall for this and remain neutral in matters relating to Iran and their mullah controlled governance. US doesnt care who supports Iran. @Khan Well said. Not a good idea to rub wrongly on US and Saudi Arabia, both being your closest allies. Best would be to keep quiet and mind own business. @Common Sense: Which ‘brother’ do you prefer? Iran or Saudi Arabia? Because those 2 brothers will never get on! Good decision. Time to volte face the foreign policy according to the existing ground realities. Well done Imran Khan. Pakistan & Iran are natural partners. @Sarfarz how Saudi Arabia is closer to us? Did they demonstrate such closeness when our interests are at stake or ONLY when their interests are at stake? HE needs an extra security detail now and he should listen to the army . General Bajwa has won my heart. While I approve better ties with Iran and Turkey, and scaling down military aid to Saudi, these actions run against the possibility of IMF loans. So let us be clear what we want more. @AK And Turkey, the old RCD countries. Iran was always supportive of Pakistsn, they just wanted to deal with an honest leader. They got one. Pakistan needs to hedge her bets by strengthening ties with regional powers, like Iran and Turkey, as well as Russia and China. America and Saudis cannot be relied about, neither to be trusted. @Khan you are absolutely correct.In diplomacy you can not go by emotions you have to keep balanced relationships. 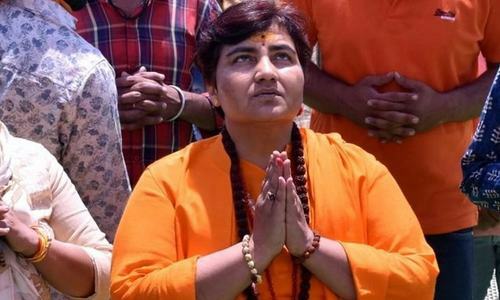 @AW just wait very soon you won’t have back and bones will be broken.in this type of situation you have to use your head not emotion.That’s call diplomacy. @leena No, India is still buying oil from Iran. A lot of people here saying Iran is a Muslim country and we should thus have friendly ties. Why is being a Muslim country a reason? Pakistan's support on any nuclear proliferation related matters is really considered to have significant impact on world opinion. All those who are praising IK, first tell ur new PM to start buying gas and oil from iran, than talk. It is plain obvious that the US is friend of nobody but Israel . Pakistan , Iran and Turkey can form a formidable block that can counter the influence of super and not so super powers in the area. The strategy should be to realign economies to the benefit of regional integration rather than being tied to the west. The dollar should be dumped as the defacto trade medium . RCD should be revived for the betterment of the people. @AK Very well said, Turkey must also join. Did the question of ChabaharPort come up? For those of us who don't know. Iran has given full access to India to Chabahar Port. So much for Iran wanting to be our friends. Pakistan and Iran must stand together against the devils who are bent on destroying the Muslim nations. To this unity the time is ripe to include other like minded Muslim nations. Is it only the Khan's govt which is attracting foreign dignitaries or it has also happened in the start days of previous government?? When Iran faces problems they remember Pakistan as a neighbors, when they are out of crisis they forget Pakistan. Unnecessary interference in US -Iran spat. First secure the economy with the help of China, Saudi Arabia and the US. Then stand with who helped us in our crisis. Imran Khan is no different than ex PMs. Pakistan first must be the priority than incapable Iran. Pakistan and Iran should have best relations irrespective of their relations with other neighbors. Pakistan and Iran have strong bonds and must be strengthened further. At least we are hearing that new government has taken steps to take the country in right direction. So you actually believe that Pak should not improve relations with Iran just because of US pressure!! What kind of logic is that? It is in Pakistan's own interests to have good relations with all its neighbours (You can change friends but not neighbours) as well as a good working relationship with the US based on mutual respect and trust. We should not get involved in foreign conflicts or agree with US or anyone-else all the time. We need to look at our own interests. Good direction - continue enhancing regional relationships, with China, Iran, Afghanistan, Turkey, KSA, UAE, Russia and India. If we solve the issues and enhance the bilateral ties, US or any power would be rendered useless. @Khan It is a perfect timing. America should know clearly that America can not impose her demands on other nations. The way Pakistan is behaving iK will never be able to secure loan from iMF.